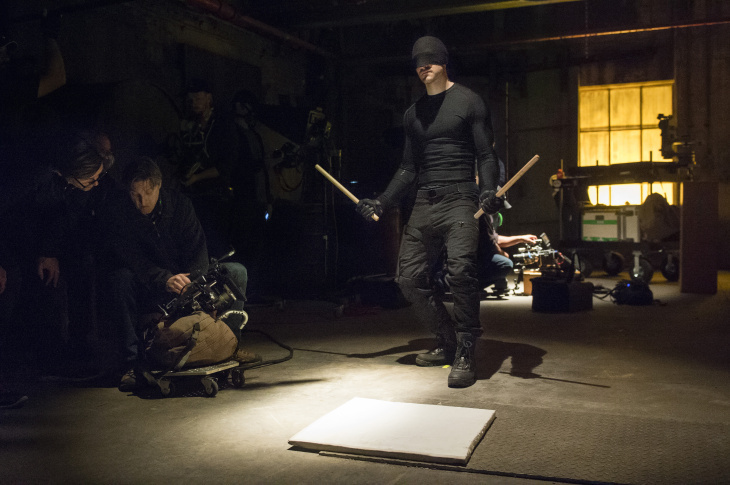 Charlie Cox as Matt Murdock with Director and Executive Producer Steven DeKnight on the set of the Netflix Original Series “Marvel’s Daredevil." 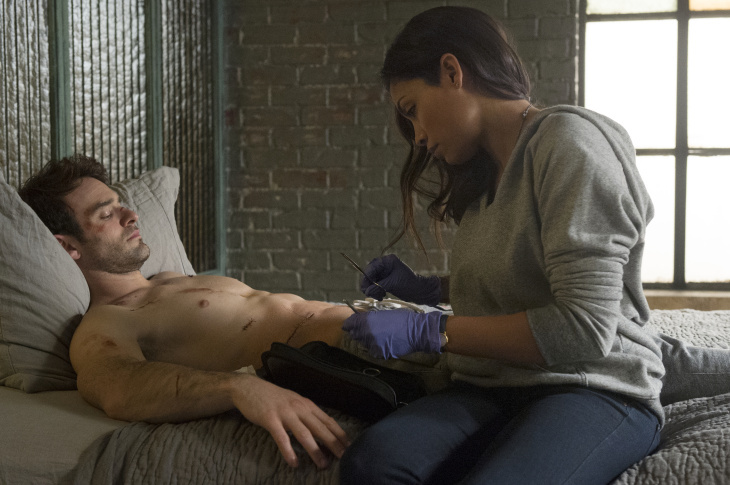 (L-R) Charlie Cox as Matt Murdock and Rosario Dawson as Claire Temple in the Netflix Original Series “Marvel’s Daredevil." Original cover of the comic book "Daredevil: Man Without Fear." 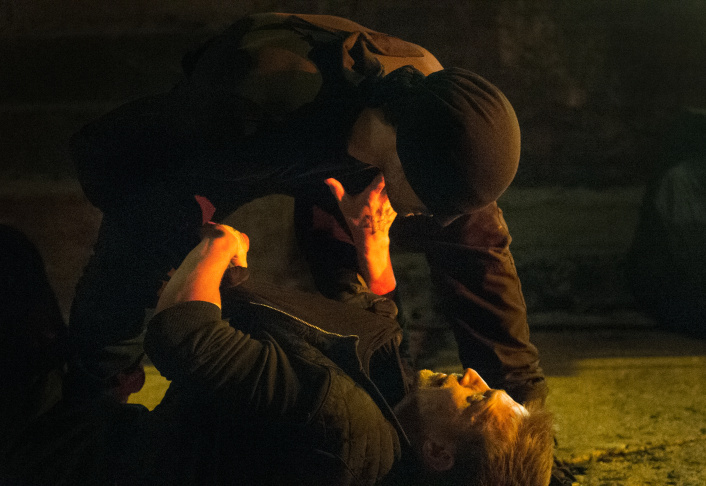 At 12:01 this morning, Netflix released the entire first season of “Daredevil" — all 13 episodes ready for one big binge. 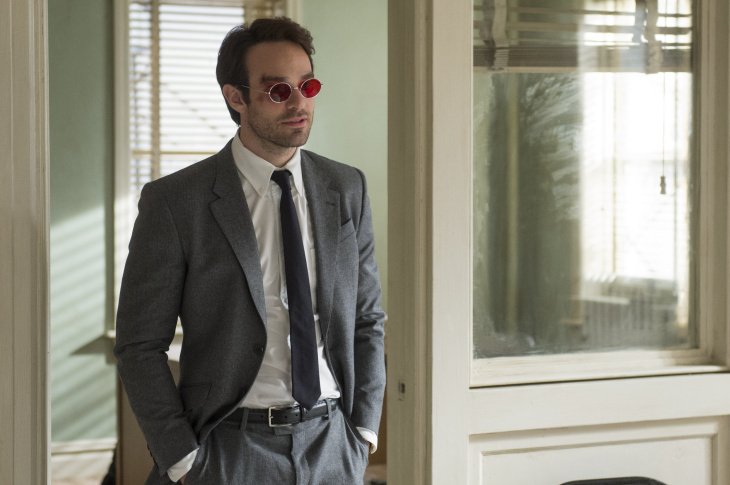 It’s a bold move not only for the streaming service, but also Marvel Studios, which is making a big bet on Matt Murdock. 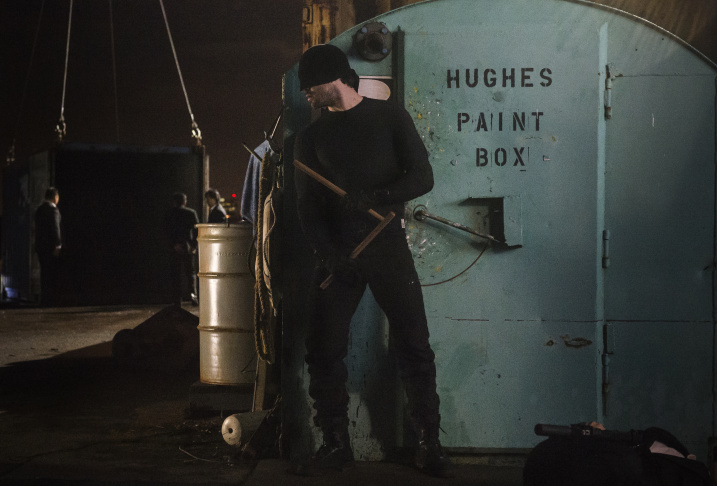 He’s the hero, played by Charlie Cox, a blind lawyer in Hell's Kitchen by day, and the Daredevil vigilante by night. If you’re used to taking the kids to Marvel’s family-friendly superheroes at the multiplex, or watching ABC's "Agents of S.H.I.E.L.D." and "Agent Carter," you might want to exercise a little parental guidance with “Daredevil” — it’s a dark and violent series. But critics are almost universally praising its storytelling. 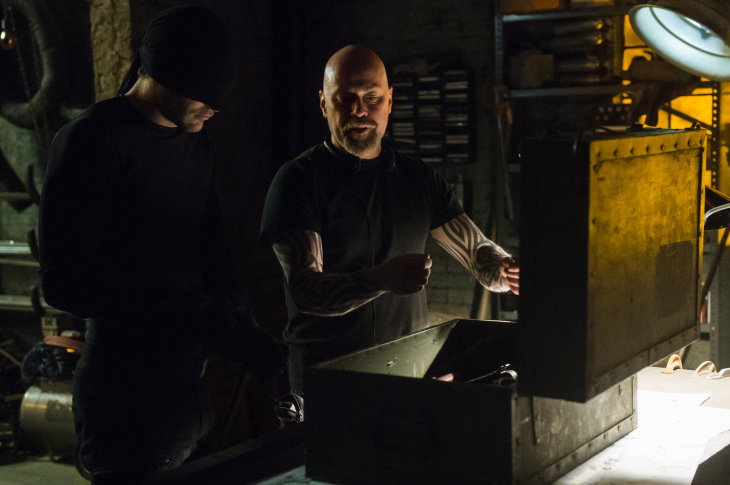 "Daredevil" executive producer Steven DeKnight joined the Frame to talk about why this series is so violent, how the design of the suit was fraught with peril and why it was crucial to shoot the series in New York. It comes down to the source material. Early versions of "Daredevil," created by Stan Lee and Bill Everett, had a bit of a lighter, more swashbuckley tone. 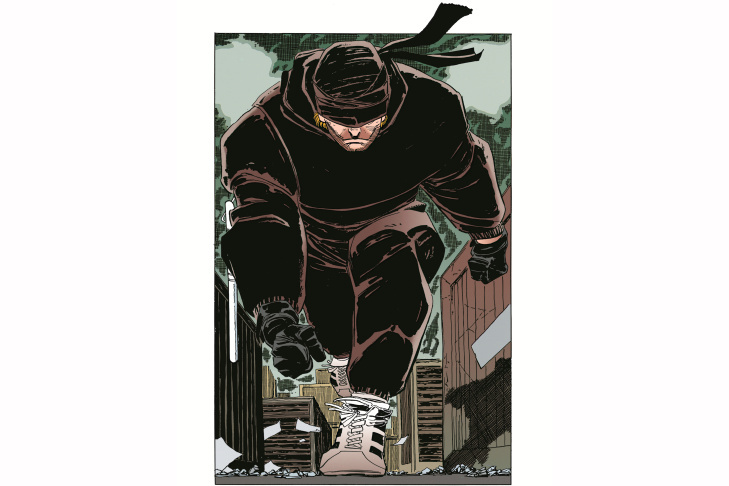 Then Frank Miller arrived on the scene and really changed everything. He did his work on Daredevil before he went on to work on Batman, for "The Dark Knight Returns." That's really what spoke to us. ... Props to Marvel, they wanted to explore a darker corner of the Marvel universe. I don't think anyone outside of the bubble understands what a risk that is, because they have a formula that works. Conversations did start, because immediately what I started doing is, 'OK, how far can we push this?' We'll push the language a little far. Without giving anything away, it got to episode 4 and I knew there was something in there that was questionable, and sure enough, they came back and said 'OK, this is too far.' I absolutely agree with their assessment. It was very important to us. We had a consultant that Charlie (Cox) worked with extensively. Charlie just absorbed everything like a sponge. He blindfolded himself and went down the street with a cane to really get as accurate as possible, the cane work. 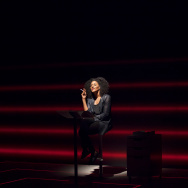 ... We didn't want just, oh, here's a writer's version of someone that is sight-impaired. First, it was thematic for the story, just to star Matt at ground zero and let him grow into being a hero. The other reason was purely practical, and the fact that to design one of these suits and built it and test it takes a lot of time. We were 10 weeks away from shooting, and one of the first things I said when I came in was we've got to start this suit, because it's going to take a lot of time and we need to have elbow room in case something goes horribly awry, which it did. It always does. One of the technical problems we ran into ... was because of the fine pattern in the suit, we ended up building the first prototype and putting it on camera and discovered that it moiréd like crazy, it strobed on camera. The first build of the suit, it was very psychedelic. ... It finally all worked out and you should all be very thankful that it doesn't strobe like crazy, because the original strobing effect on this suit would have caused you to have a seizure.